Implementing an active, rather than passive, approach to asset allocation by using market data to adjust exposure to investment classes, particularly stocks and bonds, can significantly increase investment returns.  This paper documents an important aspect of the Alhambra Investment’s strategy for dynamically managing investor asset allocation, based on financial market conditions. As documented in this paper, the term structure of Treasury notes and credit spreads, used together, are powerful tools for predicting recession and large stock market drawdowns. Outperforming the standard passive approach necessitates developing a framework to adjust asset allocation over the course of the business cycle. Why? Because outperformance is not, as many suppose, a matter of outperforming all the time – something we readily admit is impossible – but rather a matter of outperforming at key turning points in the business cycle. The largest losses in stocks occur when the economy is entering recession. 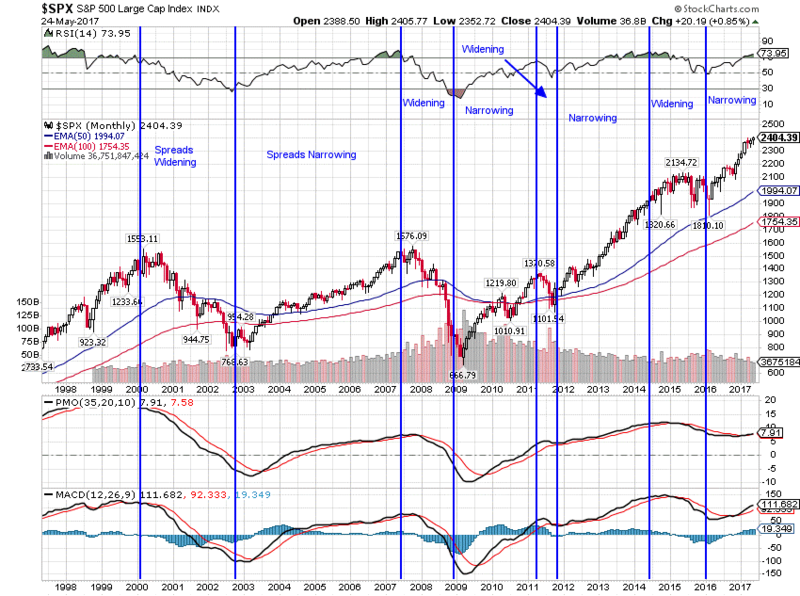 Conversely, the largest gains are generally at the beginning of the cycle as the economy recovers. Avoiding the large drawdowns associated with recession and capturing most of the gains as expansion resumes is critical to the success of a top-down tactical approach. Most dynamic asset allocation strategies do not work over time, and research has documented average investors embracing active approaches that underperform passive, buy-and-hold, asset allocation strategies. Our research uncovered many of these unsuccessful approaches, along with the two methods that stood out as potentially adding substantial value — analyzing the term structure of the Treasury market and analyzing credit spreads. In addition to the capabilities required to develop and execute a term/credit methodology, which not everyone possesses, another significant barrier to implementing this approach is the investing discipline this methodology requires. Signals to increase or decrease stock exposure, are sometimes generated when most investors are psychologically most comfortable doing the exact opposite. Increasing stock exposure, during the bottom of an economic recession when prices are lowest because prospects seem dim, is easier done in theory than practice. Our research on the business cycle indicates that there are two methods of predicting future economic growth that are valuable to the tactical investor. These two methods – analyzing the term structure of the Treasury market and analyzing credit spreads – stand out from all other methods. We combine these two methods to adjust asset allocation across the business cycle seeking to minimize risk as recession approaches and embrace it when recovery nears. In regards to using term structure as a tool to predict future economic growth, the available research starts with Kessel (1965) and is continued by a number of researchers including Harvey (1988, 1989, 1991 and 1993), Estrella & Hardouvelis (1991), Plosser & Rouwenhorst (1994), Chapman (1997), Kamara (1997), Roma & Torous (1997) and Hamilton & Kim (2001). All these papers have demonstrated that the term spread, the difference between yields of long term and short term bonds, provides predictive information about future economic growth. Specifically, these papers demonstrate that a positive term structure is consistent with a subsequent increase in economic activity while a negative structure is consistent with subsequent recession. The papers offer various explanations for this phenomenon, most prominently consumption smoothing (essentially an Austrian concept), but the conclusions are the same. The term structure offers a market-based method for predicting the direction of future economic growth. It does not offer much in the way of predictive value about the magnitude of these changes. From an investment timing perspective, the fact that the term structure is positive or negative is not sufficient to adjust asset allocation. It is important to observe the movements of the term structure through time to determine when an asset allocation change is warranted. The movements of the term structure through time provide valuable information to investors about the change in expectations for growth and monetary policy. When the term structure is flattening (moving from a high positive value to a lower positive value), the economy is moving closer to recession and when the term structure is steepening the market is looking toward renewed growth. Therefore, in general, as the term structure flattens, an investor would reduce equity allocations and raise fixed income allocations. Further, as the curve flattens, long-term bonds should be increasingly preferred over short-term bonds. As the curve steepens, an investor would move toward a higher equity allocation and shorter maturities. A review of the historical evidence regarding the term structure and the onset of recession and recovery provides ample evidence of its predictive power. Both of these term spreads have signaled past recessions through an outright inversion of the curve although there are false signals in both directions. The curve can and has flattened without a recession. In addition, as you can see, the flattening of the curve does not provide much information about the timing of the subsequent recession. Lead times can be as long as two years or as short as a few months. For the recovery portion of the business cycle, moving from recession to growth, the term structure provides less useful information as the degree of steepening required to induce recovery appears to be rising over time. In addition, the length of time the curve must remain steep to induce recovery seems to be lengthening with each subsequent recession. The reasons for this are not obvious and require further research, although the increased use of monetary policy in recent decades as a countercyclical growth measure seems a likely culprit. One factor to consider in choosing the portion of the curve to use in forecasting is the current suppression of short-term yields by the Fed. With the Fed Funds rate at zero, the usefulness of the shorter end of the curve may be limited more than in the past. In Japan, where rates have been at zero for a much longer period, recessions have not been preceded by outright inversions since rates were pegged at zero. Given that the Fed has less control – although still influential – over the longer end of the curve, it seems prudent to use a variety of curves rather than just the traditional 10/2. Monetary policy and expectations regarding monetary policy also play a role in shaping the yield curve. The yield curve in the past has steepened in response to cuts in the Fed Funds rate and flattened in response to hikes. Note: In the post-crisis period after the FF rate reached zero, the Fed implemented multiple versions of QE. The changes in QE also affected the yield curve. During periods of QE, the curve steepened. After the end of QE1, the curve flattened but steepened again when QE2 started. Twist did not have an easing effect as the curve flattened. QE3 and 4 steepened the curve again. Tapering started the curve flattening again. In other words, QE affected the yield curve in exactly the same way changing the Fed Funds rate did. Effective? Maybe but if so it was a weak economic growth response. That might be all we can expect in an era of high debt and anxiety. The point is though that monetary policy, even at the zero bound, has been effective if one assumes changes in the yield curve are evidence of such. The literature on the predictive value of credit spreads is not nearly as voluminous as for term structure but the evidence so far is encouraging. Most of the research has been done by the NBER and the Federal Reserve and has reached similar conclusions. Credit spreads are predictive of economic activity 1 to 4 quarters in advance (as opposed to 1 to 8 quarters for term structure). Various theories are presented to explain the predictive power of credit spreads but they are all a function of the ability or willingness of various sectors of the economy to take risk. This would seem to conform to George Soros’s theory of reflexivity in which it is market changes that cause changes in the real economy rather than the other way around. A widening of credit spreads from a reduction in risk-taking behavior by investors leads to a reduction in credit to the marginal borrower thereby reducing economic activity at the margin and creating a recession. For the investor, the direction of causation is probably unimportant. The fact is that credit spreads tend to widen ahead of significant stock market corrections and recessions. Used in conjunction with term spreads, credit spreads provide a powerful tool for adjusting asset allocation in real time. While a flattening curve for term spreads may warn of recession, credit spreads offer a more timely confirmation of economic stress. Term spreads tell us in broad strokes where we are in the business cycle. If one thinks of the business cycle as a sine wave the yield curve can give us only general information about where we are in the cycle. If the yield curve is flattening, we can say that we are on the curve between ‘recovery’ and the other side of ‘boom’ and that the closer we are to ‘flat’, the closer we are to the end of the cycle. When the yield curve is flat we can say that we are approaching recession but it could be anywhere from 1 to 8 quarters hence. The yield curve will start to steepen before the onset of recession and continue until at least the trough and usually for well after. 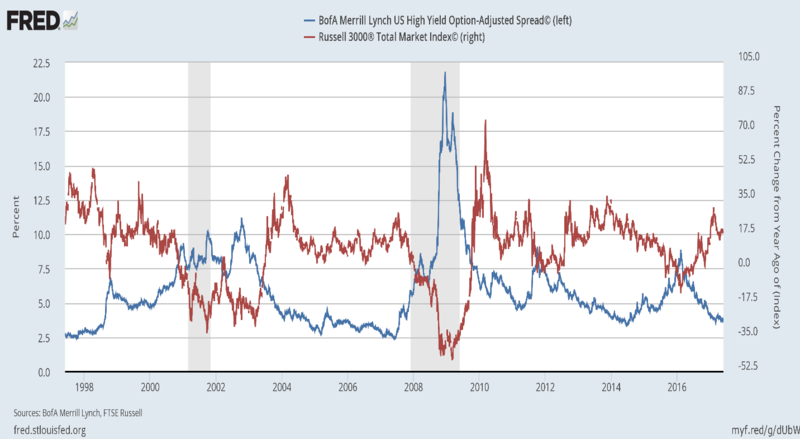 Credit spreads can continue to narrow even after the yield curve goes flat indicating a continued willingness on the part of investors to take risk. Waiting for credit spreads to widen should allow an investor to capture more of the gains at the end of the cycle by delaying a major shift from stocks to bonds. The use of credit and term spreads together provides the investor with powerful tools for timing the business cycle and asset allocation shifts. There are false signals and there is room for interpretation but the combination of widening credit spreads and falling growth expectations is not to be ignored. As can be seen in the graph above, the shape of the yield curve in the past has been largely a bond market response to changes or expected changes in monetary policy. As the Fed raises interest rates, the yield curve flattens. When the Fed cuts rates or is expected to cut rates, the yield curve steepens. Indeed it may be that the steepening of the yield curve is what induces the recovery as financial intermediaries are incented to lend long-term with wide spreads. That would explain the lengthy period of high spreads following the financial crisis in 2008 as even with a wide spread, banks were unwilling to lend. The curve had to stay steep for a longer period of time to induce recovery. Since we are generally looking for a framework within which to adjust asset allocation to avoid large capital drawdowns rather than a set of definitive rules, we might generally assume that once the yield curve has steepened to a historically high level that risk has been sufficiently reduced that further reductions in allocations to risk assets (stocks) are unwarranted for the long-term investor. As the curve flattens an investor would generally want to reduce the risk allocation and raise the bond allocation. Once the curve has completely flattened or inverted, the allocation to risk assets should be approaching its minimum for the cycle. This would seem insufficient though if one’s goal is to maximize gains across the cycle. As can be readily seen, the curve can flatten and stay that way for a considerable period without serious economic consequences. The curve was completely flat after the ’94 tightening cycle and never steepened significantly until the onset of recession in 2001. Maintaining a minimum allocation to stocks during one of the greatest bull markets in history would have been painful, to say the least. 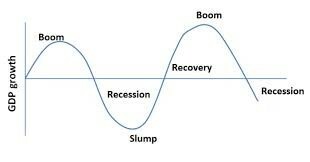 What is obvious is that the curve steepens right before the onset of recession. This steepening is due to a rapid drop in short-term rates and has in the past been driven by expectations of a rate cut. Even with current low rates, we expect that to continue to be true. However, we also believe it will limit the potential steepness of the curve and may have an impact on the degree and pace of recovery. While the yield curve does provide important information about the business cycle it is important to interpret the movements correctly. Nominal bond yields and TIPS yields should be observed to determine what is happening to inflation and real growth expectations. TIPS yields are a proxy for real growth expectations while the difference between nominal yields and TIPS yields are a proxy for inflation expectations. In general, we should expect to see both nominal yields and real yields (TIPS yields) falling prior to the onset of recession. Every major stock market correction is associated with a widening of credit spreads. The largest stock market losses happen when widening credit spreads are accompanied by a steepening yield curve. Stock prices are heavily influenced by Fed policy. The largest gains are seen near the end of an easing cycle and the largest losses are associated with the end of a tightening cycle. The degree of steepness matters. Steeper curves are associated with larger stock market gains as the economy exits recession. How the yield curve is changing is important. A steepening curve that is due to long-term rates rising faster than short-term rates is not the same as one that steepens because short-term rates are falling faster than long-term rates. In general, rising rates are bullish while falling rates are bearish. TIPS provide important information about real growth and inflation expectations that should be taken into account in yield curve/credit spread analysis. 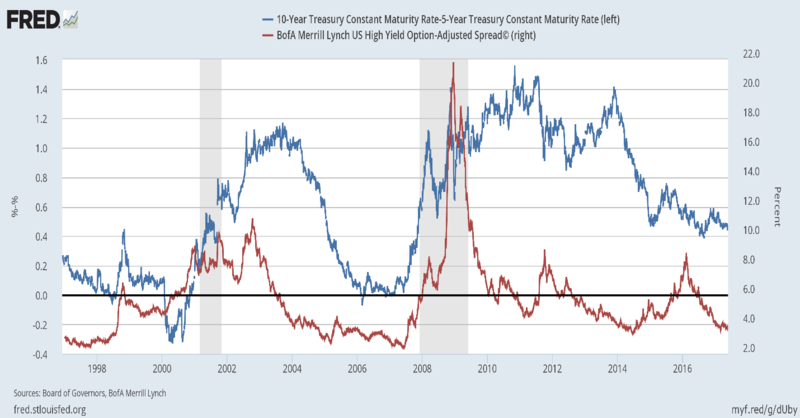 Credit spreads and the yield curve are best used together, one as confirmation of the other. A widening of credit spreads that isn’t associated with a steepening curve may cause a stock market correction but it isn’t a recession signal. The allocation moves from most conservative when inverted to most aggressive above 2%. Ideally, you would put on your most aggressive allocation above 2% and slowly move to your allocation to a more conservative stance as the curve flattens, getting to the most conservative allocation after inversion. Then as the curve steepens at the onset of recession the allocation wouldn’t change until the curve reaches its peak and starts to flatten again. In reality, that’s a lot simpler to write than it is to execute. For example, there is the possibility – indeed we think the probability – the curve never reaches flat or inverted before the next recession. So the move to the most conservative allocation is somewhat subjective and will require analysis of other factors to determine the best timing. The direction of nominal yields and the inflation and growth expectations embedded in TIPS yields must be considered before making an asset allocation change. Credit spreads are monitored on a monthly basis to generate buy and sell signals. A sell signal is generated when the monthly change in the spread exceeds our threshold. An additional sell signal is generated if the monthly change is very large. Sell or buy signals from credit spreads are used to confirm the yield curve analysis and vice versa. Due to the subjective nature of some of these observations, it is hard to quantify the value added. We believe though that the methods we’ve developed for interpreting changes in the yield curve and credit spreads will add 1 to 1.5% per year to static portfolio returns. Our macro approach to investing across the business cycle produces results which exceed the static, passive approach by a significant margin without a consequent rise in volatility. It reduces drawdowns as the economy approaches recession and captures most of the gains associated with economic expansion. Macro-economic observation and interpretation can assist the investor in making tactical changes to his portfolio across the business cycle. The goal of this research was to find a way to simplify the process and make it less subjective. We believe the methods we’ve laid out here – and others that are not – do exactly that by identifying patterns that have repeated in past business cycles. We use these observations to adjust the Alhambra Portfolio when appropriate. Bull Flattener: Long-term rates are falling faster than short-term rates. This can happen in a flight to safety trade or when inflation expectations fall. It is called a bull flattener because it often precedes an easing of monetary policy which is reckoned to be bullish for the economy and stocks. Bull Steepener: Short rates are falling faster than long rates. This is generally the case when the curve is steepening as monetary policy is eased as the economy enters recession. It is known as a bullish sign but timing is important. Generally, recovery will not start until the curve has steepened to near its historical highs. Bear Flattener: Short rates rising faster than long-term rates. 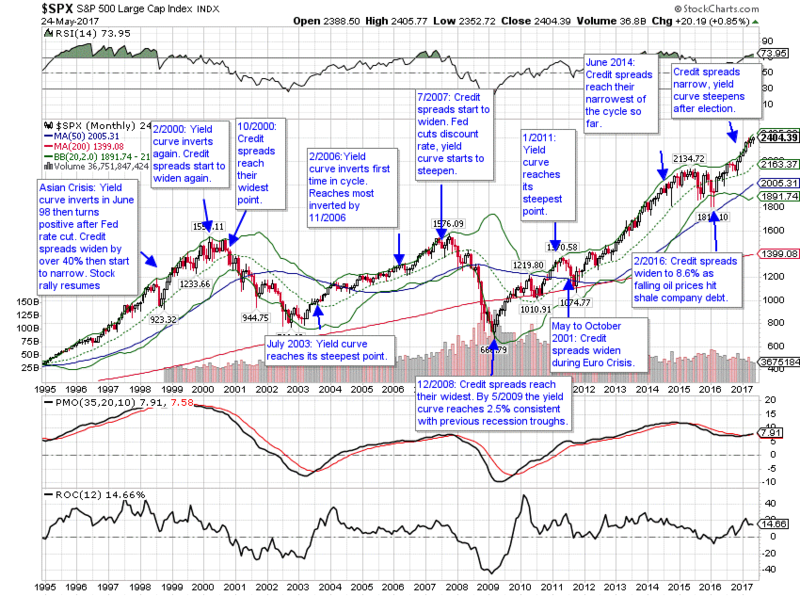 This scenario generally occurs near the peak of the cycle and again timing is critical. The curve can continue to flatten for some time in this scenario without the appearance of recession. Indeed if the Fed achieves a “soft landing” as happened in the mid-90s it may not be bearish at all. Bear Steepener: Long rates rise faster than short rates. Generally happens when inflation expectations rise and precede a tightening of monetary policy.